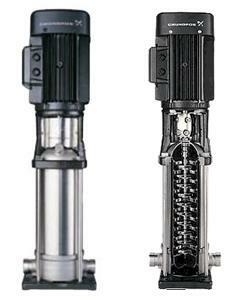 The Grundfos CR pump range covers both bare shaft and motor pumps. With choice of drive, 11 pump sizes, hundreds of pressure ranges and 4 basic materials including titanium, stainless steel (316 & 304) and cast iron, you can always find the right pump for the job. The CR has been engineered using state-of-the-art processes in order to be reliable, maximise efficiency and easy to maintain. The benefit to you is reduced running and maintenance costs. CR motor pumps are fitted with the highly reliable, remarkably silent and efficient Grundfos MG motors. You also have the option of the LiqTek dry running protection which shuts the pump down should the liquid source run dry. This saves any costly permanent damage to the pump. Bare shaft CR pumps can be coupled to diesel or electric drives to suit any requirement. The Pump House offers a range of quality electric and diesel motors including Yanmar, and can help you design a pump system incorporating the CR to your exact requirements.